It’s been years in the making, but Christian Bergman finally made it. On Saturday, the Colorado Rockies announced the 26-year-old right-hander will make his Major League debut Monday against the Atlanta Braves, starting in place of the injured Jordan Lyles. Bergman, who had a rough couple starts in April, turned it on in May to show he belongs in the Major Leagues, tossing 21.2 consecutive innings of scoreless ball from April 28-May 13. Bergman was even better at home, going 26.2 consecutive shutout innings from May 3-June 3 — a Sky Sox record. In five starts at Security Service Field, Bergman had an ERA of 2.04 (35.1 ip, 8 er) and just two home runs given up. After being just a 24th round pick in 2010, Bergman continues to prove people wrong by performing at every Minor League stop. In 2011, he was a Northwest League All-Star, Pitcher of the Month and Pitcher of the Year. In 2012 at High-A Modesto, Bergman was a California League Postseason All-Star and was the CAL Pitcher of the Year after going 16-5 with a 3.68 ERA in 27 starts. Last season, Bergman kept performing and was named a Texas League Mid-Season and Postseason All-Star, as well as a Pitcher of the Week during early August. And now, despite being a low-round pick and not throwing harder than the low-90s, Christian Bergman is in the Big Leagues. Throughout the season, Sky Sox pitching coach Dave Schuler saw Bergman make the necessary adjustments for pitching against better competition, for pitching at higher altitude parks, as well as at any ballpark in the nation. “He has a really great knack and that’s the best way to put it, he has a knack to do things to make corrections in the zone,” Schuler said last month. “He does that with pitches and he does that quite easily because he knows himself so well, so I think the first couple of outings he had he was feeling just like anybody would in his first year at the Triple-A level. Whether he was good enough and he realizes where he has to make adjustments and he’s able to make them. After RHP Eddie Butler was placed on the DL, RHP Chad Bettis was recalled to Colorado for the second time this season. Bettis began the season on the Rockies’ Opening Day roster. With the College World Series nearing, both Bettis’ (Texas Tech) and Bergman’s (UC-Irvine) alma maters will take place in the tournament in Omaha, Neb. 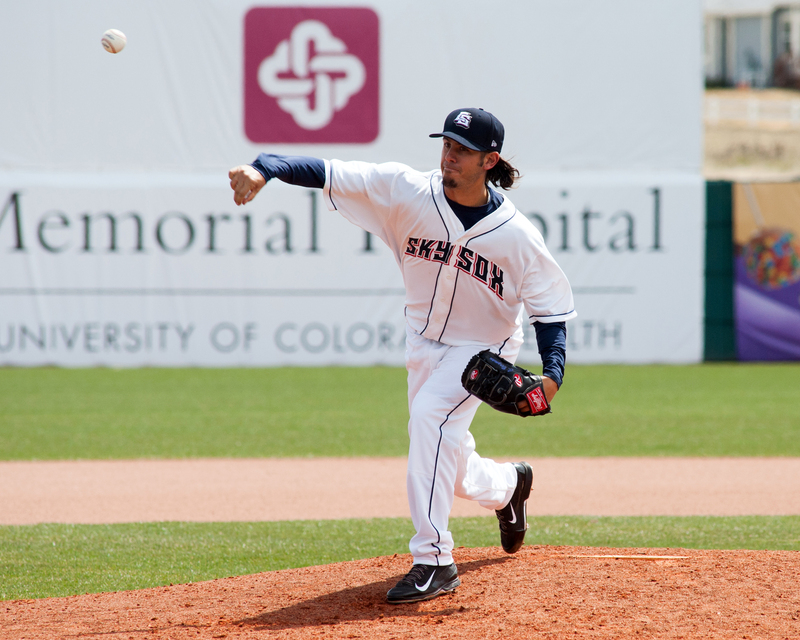 RHP Mike McClendon, who pitched for the Sky Sox in 2013, will make the start for the Sky Sox on Monday. McClendon made the Rockies Spring Training in 2014, but was cut and signed with the York Revolution of the Independent Atlantic League. He resigned with the Rockies on 6/2/2014, and made his first first start with the Double-A Tulsa Drillers on 6/3. RHP Wilton Lopez was designated for assignment and placed on the temporary inactive list.